At this time of year we often spend more time indoors because of the colder weather. 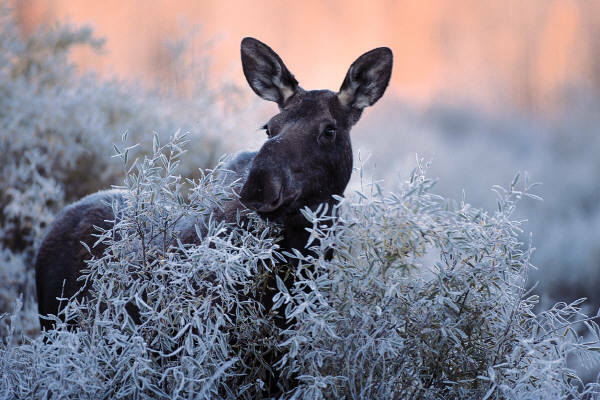 The colder weather affects wildlife, too. Animals deal with the cold in a number of ways. Some migrate, some hibernate, and others congregate! But whether they stay or leave they act in ways that help them to deal with the burning of more calories to handle the cold at a time when there is reduced access to food. 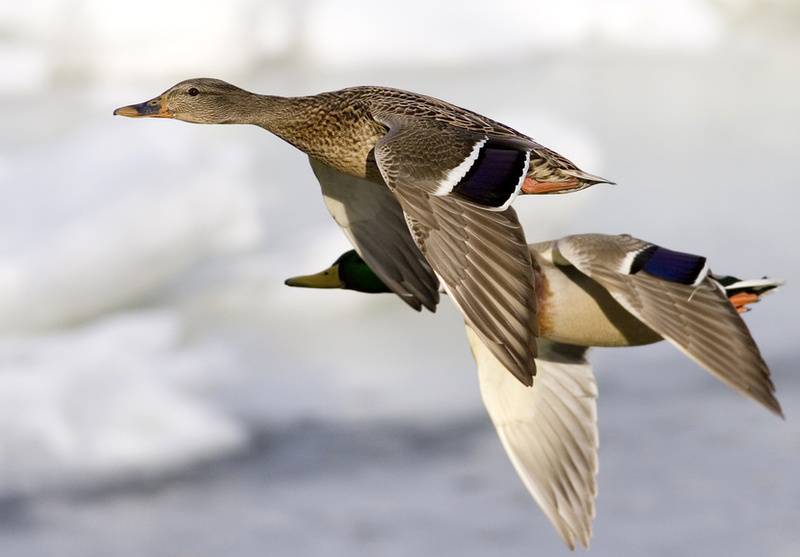 Many species of birds fly south to where the winter weather is warmer, so they simply avoid the cold altogether. And for those who remain, this is the time of year to put out birdfeeders. But once we start feeding we should take care to continue feeding until a natural food source is available again in spring. Some animals who either hibernate or deep sleep are bears, raccoons, bats, and skunk. First they put on as much fat as they can to help them make it through their long deep winter sleep, and then they find a sheltered spot to wait out the winter. So, consider the timing of when you put out your bird feeders, to make sure it is the birds you’re attracting to your backyard. Frogs and turtles also hibernate, but they do so by burrowing deep into the mud at the bottom of the ponds where they live. Then they drastically reduce their heart rate, so they require far less energy to survive until spring ice out. Some species of frog can actually freeze solid! Animals such as beaver and muskrat do not hibernate, but spend much more time in their lodges. They do come outside, mostly to go to the bathroom! In fact, if you were to go out on good solid ice around a beaver or muskrat lodge in winter you would easily find the location of their “toilet” facilities. And muskrat, who tend to live alone in individual lodges from spring through fall, will congregate to make it through the winter cold - moving in together to benefit from the added body warmth. But if you go out into the woods and fields in winter you’ll still see lots of tracks left by animals who continue to hunt and feed throughout the winter. Many small mammals, such as mice, stash food for winter. And some remain fairly active under the snow, creating tunnels. 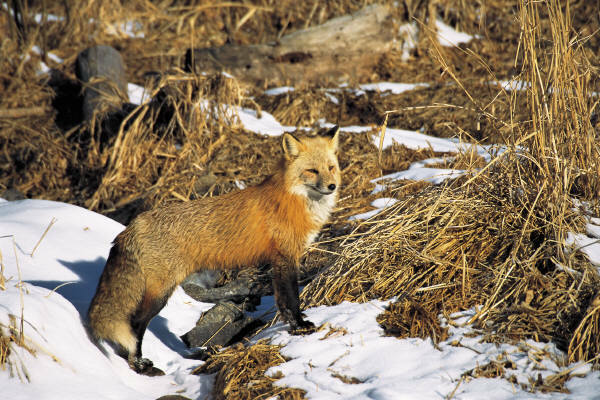 Animals such as coyote and fox can be seen hunting these small mammals throughout the winter. And what about fish? Fish hang out in the deep! Water has a unique property distinct from all other liquids, it is most dense at 4°C, and this means that ice (which forms when water reaches 0°C) will float and the bottoms of lakes and ponds will remain liquid - but very cold! So, fish can still move about, but they just do far less of it, as food is scarce in winter. What do you suppose happens with insects? How do they survive from year to year? Something to consider for another chapter of Kids’ Corner!